Shopping for business insurance for your lawn care or landscaping business can mean hours of searching, new lingo to decipher, and limitless options to compare. However, it doesn’t have to be that complicated. Simply consult this handy guide for navigating the world of insurance coverage and the seven tips you need to know before signing off on a policy. No matter how experienced you are or how careful your lawn care business may be, unpredictable accidents and losses happen all the time. For example, if one of your employees were injured on the job, would your business have the means to cover medical expenses? What about court costs if a third party sues your business due to property damage you or your employees caused? Your lawn care business insurance in both these cases can be the difference between your business surviving a financial blow and closing its doors for good. 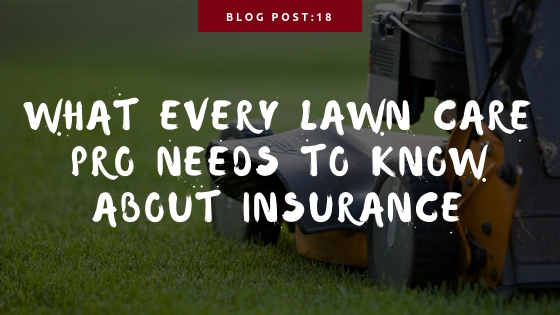 Before you purchase a business insurance policy for your lawn care or landscaping business, take a look at these seven tips to help you find the appropriate coverage. Assess your insurance needs and risks. Find an insurance provider that you trust. Opt for the best coverage rather than the lowest cost. Work with lawn care insurance specialists. In order to find the coverage that meets the needs of your business, first you’ll need to know the risks your business faces. A good starting point may be to ask yourself what potential accidents and injuries your employees face as they carry out their work. Another consideration is the equipment you depend on to conduct your services. If an accident or natural disaster were to destroy your lawn care equipment, would you have the means to replace it quickly? The best thing you can do to protect your business is to prepare it for the worst-case scenario and have the proper insurance that covers such events. When you apply for a policy, your insurance company will also assess your business’s risks and determine the amount of exposure they’ll accept. Your coverage premium is dependent on the level of risk your carrier will cover, so it’s beneficial for you to prioritize the risks that could cost you the most. When you take to the Internet to find business insurance, you’ll quickly see that there’s no shortage of options. The challenge lies in finding the time to sift through them all. Plus, you’ll also want to find a credible provider — preferably one with an “A” rating. An “A” rating is reserved for the most trusted, nationally renowned providers who’ve built a reputation on quick payouts, quality products, and reliable terms. If you’re like most small business owners and don’t have much time to spare, you can save the hours of searching and background checking by working with an agent, such as the insurance experts at insureon. Our agents already have longstanding relationships with top-tier providers, and we do the work of finding multiple quotes for you to compare at your leisure. You’ve worked hard to build your business, which means you’ll benefit from thinking of business coverage as a necessary expense. While it’s true that you’ll typically pay a little more for a top-tier insurance policy, that plan will likely offer more coverage than a less expensive option. In the event of a covered claim, every penny counts! Though it may be tempting to go with the cheapest policy you find, you will want to take into account that they may be inexpensive because of the carrier’s reputation for slow payouts or inconsistent terms. Base your purchasing decision on the amount of coverage and the quality of that coverage rather than only the cost of the policy. If you’re looking for coverage at an affordable price, be sure to consider purchasing a Business Owner’s Policy (BOP). If your business is eligible for this policy, you can receive General Liability Insurance and Property Insurance together at a discounted rate. When you work with brokers who specialize in insurance for your specific line of business, you benefit from their extensive experience with your industry. Our experts at insureon, for example, know the unique risks your business faces and the coverages that could save you millions if something goes wrong. Property Insurance / Business Owner’s Policy (BOP). Sure, insurance policies may not be the most exhilarating read, but before you sign anything, make sure you understand exactly what your policy covers and what it does not. You don’t want to be surprised down the road when you try to file a claim you thought was covered, but actually isn’t. Each business insurance policy has different limits, exclusions, and fine print, so don’t be fooled into thinking if you’ve read one, you’ve read them all. Knowing your policy means you can ensure you don’t have gaps in your coverage and that your limits are high enough to meet your needs. When in doubt, be sure to ask your insurance agent for clarification. A deductible is the amount you pay before your insurance policy kicks in coverage for a covered claim. Most policies come with one. When shopping for policies to protect your business, you may be tempted to take on a policy with a higher deductible because of its lower premium. However, when it comes time to file a claim, you may regret this decision, as you will have to pay more out of pocket for a covered event. By contrast, a lower deductible usually means your premiums are more expensive, but your insurance provider will provide a higher payout for your claim. While weighing your options, consider how much of a financial loss you can afford to carry yourself. As a rule, do not take on a deductible that could jeopardize your business. There’s no end to how costly the litigation process can be. Between attorney’s fees and settlement costs, you’ll want to have all the coverage your insurance policy provides if your business is ever sued. For this reason, many small business owners choose to further extend their policy limits with Umbrella Liability Insurance, an affordable way to offer millions of dollars in added protection to your Workers’ Compensation policy and General Liability policy. Ready to give your business the coverage it needs to weather a financial crisis? Simply complete our all-online application today, and we can help you find the policies that safeguard your lawn care or landscaping business.